We are an accredited training practice and are involved in training doctors whilst they undertake a placement in general practice. Our practice has a relatively small catchment area but previous trainees have enjoyed a wide range of problems presented from a very diverse population. Druids Heath, Birmingham, B14 5SB. We are pleased to welcome our new GP Trainees: Dr R. Hall ( female ) ST2 and Dr J. Hunt (female)FY2 who will be with us for the next 4 months. During their time with us, they will be seeing patients as members of our GP clinical team. Please make ensure that you have ordered and received enough medication to last you over the holiday period. 3. Walk in In Centre, Solihull Hospital; LEFT entrance at A/E. Contact lists and Advice for Urgent Help and Advice on various issues. 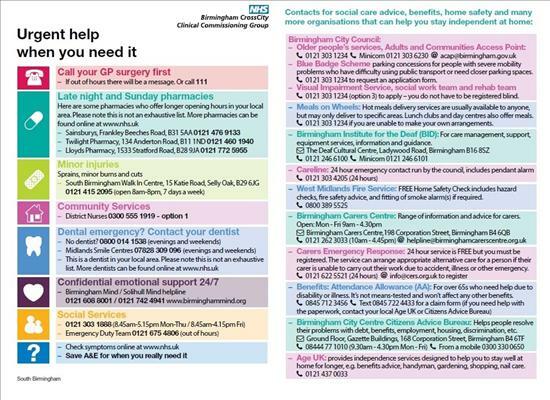 South_Birmingham_urgent_care_sheet.pdf download copies for safe keeping as a reminder. Walkin In Centre, Solihull Hospital; LEFT entrance at A/E. As a one off, the practice will be closed from 1.00 p.m. on the afternoon of Wednesday 20th March 2019, to allow for a staff team building event. Adequate medication at all times. Please make ensure that you have ordered and received enough medication to last you over weekends including Bank holidays or festive periods or when you plan to go on your holiday. 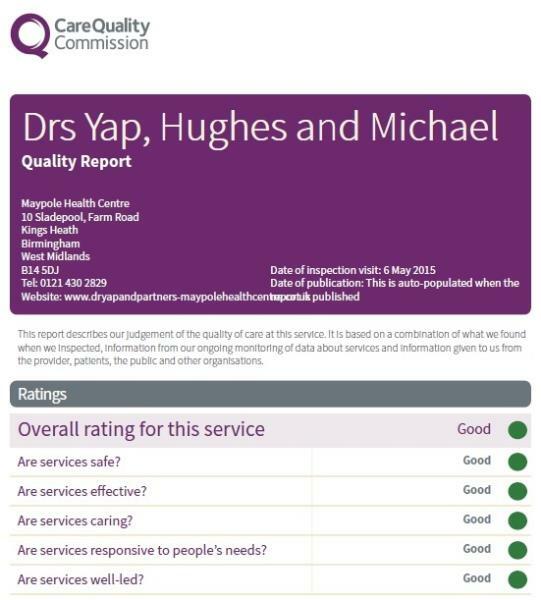 We are pleased to publish the outcome of our CQC inspection in May 2015. The Department of Health have advised that they will begin offering the shingles vaccine on a phased introduction. At Maypole Health Centre, we understand this to mean that they will be introducing the vaccine to certain age groups between the ages of 70 and 79 yrs ( please note only patients age 70 and 79 years old fit the criteria at present). 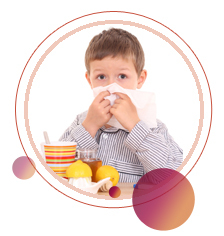 We anticipate its introduction to be around Autumn ( flu season) and so we would anticipate inviting those who will fall into this criteria in at the same time as they would usually expect to attend for their seasonal flu vaccine making it doubly important to watch out for the flu clinic dates. Please be advised, we will be unable to vaccinate patients who do not fall into the age groups defined by the Department of Health. If you are aged 65 or over, carers or are in an “at risk” group eg diabetes, heart disease , COPD, etc..or are pregnant ,please book your flu injection between end of September 2017 and March 18. Broad Meadow Health Centre, Kings Norton. Contact telephone number 0121 466 4680. Our Health Visitors will run their weekly Child Health Clinic here at the Practice on a Wednesday afternoon from 1:30pm to 3:00pm . Did you know that you can now have your repeat prescription sent electronically ( EPS) to your Pharmacy by the Practice? This would save you having to visit the practice to collect your completed prescription form. Please ask at your Pharmacy or our Receptionists for further details. The Patient Participation Group meet on a quarterly basis, usually on a Thursday from 1:00 p.m. - please ask when the next P.P.G meeting will be held. You may telephone to speak to a Doctor between 11.30 a.m. and 12.30, or our Nurse Practitioner between 12.00 and 12.30. You may telephone to request your test results after 11.00.a.m. In England and Wales a new offence of driving with certain controlled drugs in excess of specified levels in the body comes into force on 2nd March 2015. There is already an offence of driving whilst impaired through drugs (whether due to non-medical use of drugs or due to legitimate use of medicines) in section 4 of the Road Traffic Act 1988. This offence will remain in force alongside the new drug driving offence. This offence is not new and it has not changed. The new offence refers to driving, attempting to drive or being in charge of a vehicle with a specified controlled drug in the body, in excess of a specified limit (Section 5A of the Road Traffic Act 1988 as amended in April 2013). Police have new powers to test and prosecute drivers who are suspected of driving having taken certain drugs in excess of specified levels in the body. Roadside drug screening devices will be developed using oral fluid (saliva) to identify if the person driving or in control of the vehicle has taken a drug as listed below (or one that may be metabolised into one of these drugs). Following a positive screening result using oral fluid, the person can then be requested to provide a blood sample for evidential purposes, to enable prosecution for the new offence if above the specified limit. Check the leaflet that comes with your medicine for information on how the medicine may impair your driving ability. You must not drive if you feel sleepy, dizzy, are unable to concentrate or make decisions, have slowed thinking, or if you experience sight problems. If the medicine is one that could affect your driving ability, you should not drive until you know how the medicine affects you as an individual, particularly when starting a new medicine or following a dose change. Only drive if the drug you are taking does not impair your driving. If you start a new medicine, even if it is one that does not directly affect your driving you should check with your pharmacist if it could have an effect on any of the medicines you are already taking that could in turn affect your driving. Alcohol can enhance the side effects of certain medicines. Keep evidence that the medicine you are taking is either prescribed by a healthcare professional or bought over the counter, e.g. a repeat prescription slip for prescribed medicines and a patient information leaflet for medicines purchased over the counter. Continue taking your medicines as prescribed.